BabyCarers.com provides the easiest way for parents to find a reliable babysitter, childminder or nanny in their area. Those looking for employment as a babysitter, childminder or nanny can easily register on BabyCarers.com for free. BabyCarers.com was designed and coded by Orpheus Internet, and has attracted thousands of members since going online in 2008. The Early Years Foundation Stage Pupil Tracker is a web-based application designed to provide all types of Early Years schools with a simple-to-use yet comprehensive system for recording and analysing children's progress throughout the Early Years Foundation Stage, from birth to the end of the Reception year. The tracker is used by hundreds of schools and other educational establishments throughout the UK. The Learning Bus is designed to allow adult learners within Wandsworth Borough, London, to provide feedback on their experiences. This website has been implemented using PHP / MySQL and is hosted within one of our specialist data facilities. The Million Masterpiece is a global arts project. As a community we are creating a piece of artwork that will provide a unique snapshot of modern society through the eyes of one million people scattered across the world. To do this we are asking artists and non-artists alike to complete one small square of a giant digital canvas. This project has been entirely designed, coded, and hosted by Orpheus Internet and London artist Paul Fisher. PianoAccompanists.com is a website specifically designed for professional accompanists, and provides a database of locally searchable accompanists so that event organisers, fixers, students and those in need of tuition can find an accompanist with minimal difficulty. 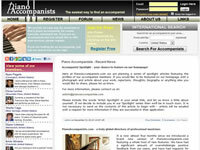 Members of PianoAccompanists.com can create a fully flexible online profile with all the functionality of an typical artist website - including photo gallery, audio/video samples and other media which are essential to the online promotion of today's concert artists and other music professionals. Orpheus Internet designed this website for eminent Israeli conductor Yaniv Attar in 2009. Yaniv Attar is the first prize winner of the 2010 Duna Szimfonikus Conducting Competition Budapest, and the recipient of the 2010 Georg Solti Foundation Award in Chicago and the 2009 Bruno Walter Memorial Foundation Award in New York. He recently completed his two years residency as the Assistant Conductor of the Alabama Symphony Orchestra.